We like to boast that custom wallpaper offers you unparalleled opportunities for personal expression. Digitally printed wallpaper has only been around for the last five years or so, so when you reflect upon earlier forms of decorative self-expression, one quickly thinks of tattooing. Tattooing has been around for thousands of years before the common era, existing in an environment that predated notions of tattooing being taboo. Once prevailing Western attitudes shifted and tattoos became subversive, people wanted them more than ever. The ability to clearly and artistically showcase an important idea or memory to a viewer is a powerful asset. This statement holds true for custom wallpaper as well as tattoos, as custom wallpaper allows you impart a multitude of ideas to the viewer based solely on your interests and passions. Whereas a tattoo will follow you wherever you go, a custom wall mural will certainly be more stationary, but will be just as illustrative about your life as a tattoo. 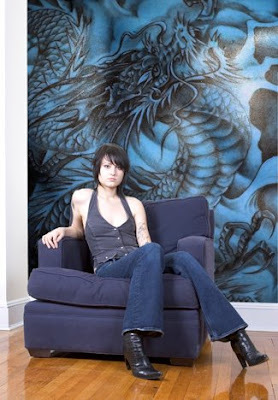 In the inspiration room we're featuring today, we've taken both ideas of custom wallpaper and tattoos and brought them together full circle, designing a wall mural based off of a full back tattoo of a dragon. And while flesh-colored walls may appeal to some, we liked the idea of adding a blue tint so the custom wall mural would match the present furnishings better. Custom wallpaper imagery is as unlimited as tattoo images, limited only by your imagination or available un-inked skin. What's more, should you grow to dislike your custom wall mural, simply strip it off the wall. If only it was so easy to do the same with that tattoo of your first boyfriend! Wall paper is really a great way to add a great artwork and/or design to your room, especially if you feel a wall hanging such as a painting might not be suitable. Personally, I would stick to the basic rules of room design though. Paint the room in darker colors if you would like to feature a dark color wall, and use bright, even white, color to feature bright color rooms. This is a simple, but effective way to blend the wallpaper into your room.